​Morning began again around 6:00 with toilet runs and coffee. John built a fire outside and I fired up the stove again to add a little heat to the cabin. ​For breakfast we had an oatmeal gruel I had made up consisting of quick oatmeal, whole instant milk, dried cranberries, brown sugar, salt, oat bran, powdered peanut butter, chia seeds and cinnamon, rehydrated with boiling water. I found the recipe online a year or so ago and even have it at home now and then. It is tasty, filling and easy to make. And it has staying power so you aren't starving in a little while. 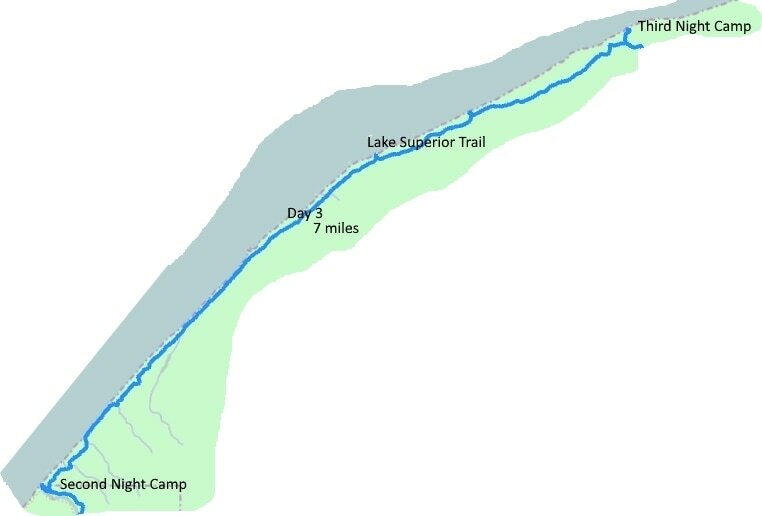 Last night we discussed whether to stick with our original trail plan and hike southwest along the lake to the Little Carp River Trail and then south east along that trail toward Summit Peak where we had left the car. When we arrived at the cabin a local man was fishing in the Big Carp River. He and his girlfriend had come in from that direction and he said the trail along the lake was pretty muddy. He had not hiked the Little Carp River Trail so didn’t know its condition but did say it was in low lying land. Likely it was wet. An option was to take the Lake Superior trail easterly along the lake and travel back to our departure car. The distances were roughly the same. 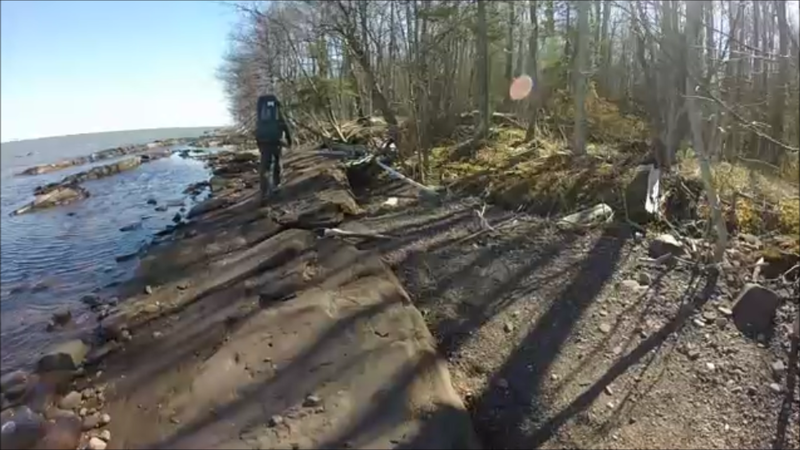 Of course, we knew nothing about the Lake Superior trail’s condition as we had not even considered it in our planning. 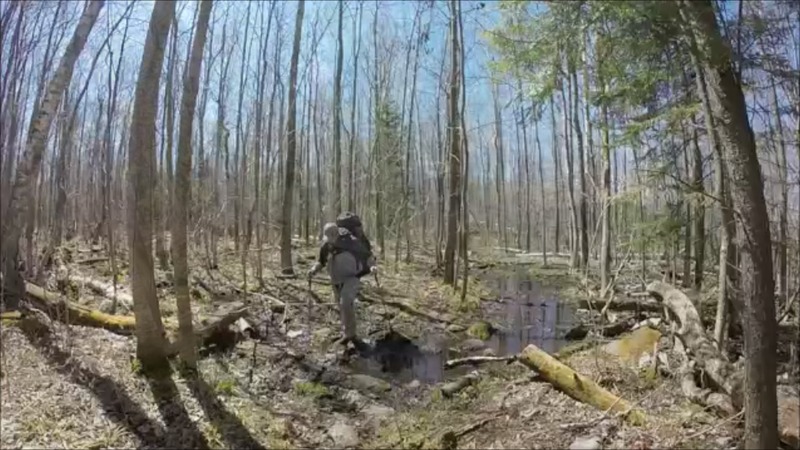 ​This morning we decided to do the Lake Superior trail. The Little Carp River trail would likely be through similar terrain as we had already hiked while the Lake Superior one offered a whole new set of sights and sounds. Without stating it I, and I think Charles, were a bit scared of the Little Carp Trail as it has several river crossings. Our “trail angel” had certainly blessed us yesterday but we didn’t want to temp him! I think John leaned more toward Little Carp but the night before he “gave” the decision to us so honored that. He did reserve the right to remind us that we knew nothing about the Lake Superior Trial, should things go sour! After it was over I think we all agreed that it was a good choice as it gave us some quite different views from those of the previous two days. ​Packing went a bit better this morning than yesterday but still was a mess. Never-the-less, we were out the door and on the trail around 9:00 again. It was kind of sad to leave behind the wonderful little cabin! 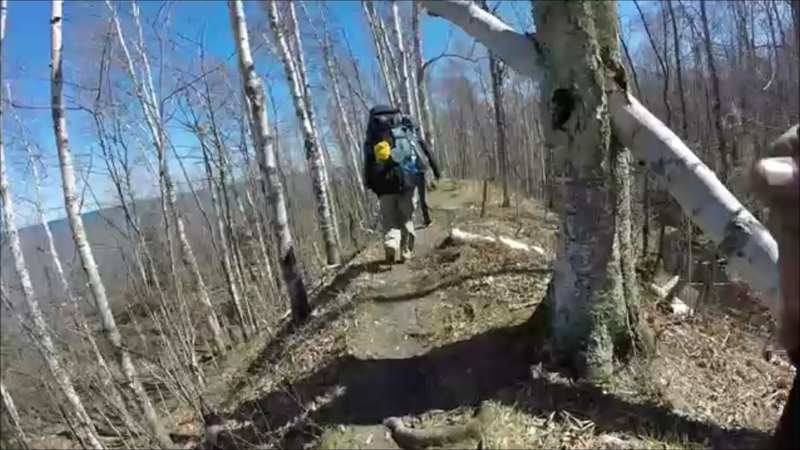 After negotiating a nearly too-steep-to-climb short hill from the lake level back up to the hill where the main trail was we headed in the wrong direction, thinking that we had seen the Lake Superior Trail back that way. But after just a short time we began to feel that wasn’t right and turned around. Charles spotted the sign to the right trail so we were off. Hiking along the shore of Lake Superior. Then it changed to water rounded stones of all sizes, still with those pesky trees and bushes for another half hour or so. And all that seemed to be piled on these large ridges of solid rock rising several feet from the beach and sometimes exposed so you walked directly on them and other times nearly covered by the other smaller rocks. Hi ridge with Lake Superior on the left and a deep ravine on the right. Ready to hit the trail on Morning 3 and leave our cozy little cabin. 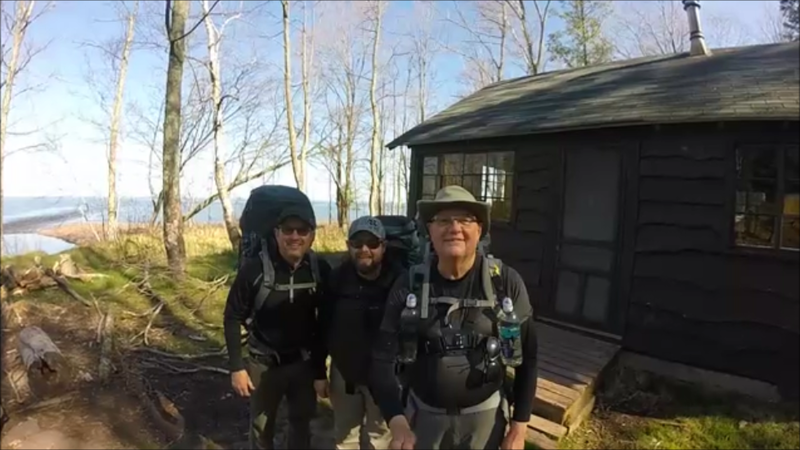 ​Shortly after getting under way, Saturday, May 6, 2017 on the Lake Superior Trail after our wonderful night in the cabin, the trail rather quickly began to descend and in a half hour or so we were on the shoreline of the lake. Initially it was almost a sandy beach, if you can think of gravel as sand. Then after a while we were stepping on, around and over varying sizes of red granite-like rocks, some several feet across. And interspersed among them were badly weather beaten trees and shrubs that wanted to swat you in the face or snag your clothes or pack. That probably went on for at least a half hour. Long solid rock ridges with large river rocks piled around. ​All of that was somewhat hard and slow going and required great attention to where you put your foot and trekking pole. Then, finally, the trail turned inward away from the beach and began meandering around and up and down through small hills and ravines, across streams and through the woods. But always well within hearing of the Lake and often sight of it. Some of the ravines had very steep sides with quite a bit of water running toward the lake requiring a lot of care not to either get really wet or slip and fall. We “enjoyed” at least an hour of that. 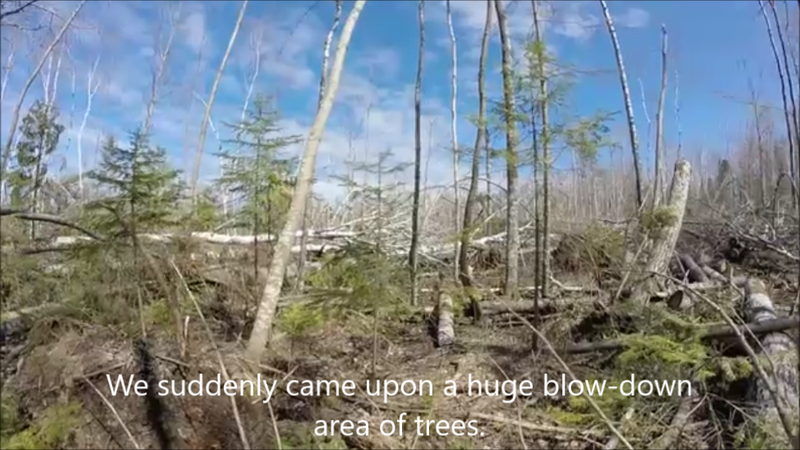 ​Then it reentered the forest much further and all was fairly smooth going until suddenly were faced with a massive area of blown down trees of every size, description and kind. Some had blown down months ago with the trail somewhat cleared through them but a lot of new stuff was down too making areas almost impassable. More than once we had to crawl under huge tree trunks with protruding, broken branches which seemed to seek out your hide or your backpack to snag or wound. A couple times we had to crawl or climb over them. And occasionally we had to remove our packs and hand them through the mess and then crawl, climb or otherwise get to the other side. None of us were actually injured but I think we all have a few memorable scratches or bruises to remember those trees by. I think the area was perhaps twice the size of a football field. The picture doesn't convey the "shock" of seeing this tangled mess completely covering our trail. ​About half way through, John and I were standing there waiting for Charles to make it through a particularly tricky place and I said to John, “This is nearly impassable!” He just said calmly, “you just have to keep going.” To make it more “fun” much of the trail through that, if you could call it that, was muddy, boggy and running water making it slippery as well. We dealt with that aspect of the trail considerably this day. I think it was then that John reminded us that we could be on the Little Carp River Trail! Seemed there was never a board walk where we needed one! ​Emerging from that tangled pile of 100 ft long toothpicks the trail was much easier though still sloppy and slippery. From time to time we would come to a board walk of 2x6 boards setting on large wooden blocks. Too often those were the “nice areas” that needed them the least while the worst areas seemed to be without! I’m sure that is not true as the mind plays tricks on you after a while. ​Either before or after the blow down area, I can’t recall which we stopped at a camp site for lunch very near the water front. We needed water and decided to fix a hot lunch, Texas Pete Chili I think. I grabbed the water bucket and headed to the lake where I found a nice large rock just a step away from the shore with a shallow pool of moving water facing the shore. So I stepped over on that rock and stooped down to put the bucket in the what… lost my footing and tumbled in. It wasn’t a big fall and there was no danger, but I was the only one with water tight boots and so with dry feet – till then! My left boot became a bucket. No one was there to witness my humiliation but when I got back to camp I had to remove my boots and socks and lay them out in the sun to dry at least a little before we resumed our hike. So much for dry feet! ​After lunch we repacked and resumed our hike east along the trail which gradually improved and without further incident arrived at the best campsite of the trip about 4:00pm. It was about a hundred feet in from the shore in a beautiful hardwood forest. A small stream was trickling by at one side, unfortunately between us and the shiny stainless steel latrine perched about a hundred yards away on a hill top for everyone to see! But all streams seem to provide roots and rocks to allow a dry or nearly dry footed crossing so nothing was prevented that needed doing. We all got a good night's sleep in our well hung hammocks this last night. Our last night at a very nice campsite close to Lake Superior, good fire ring and a latrine! 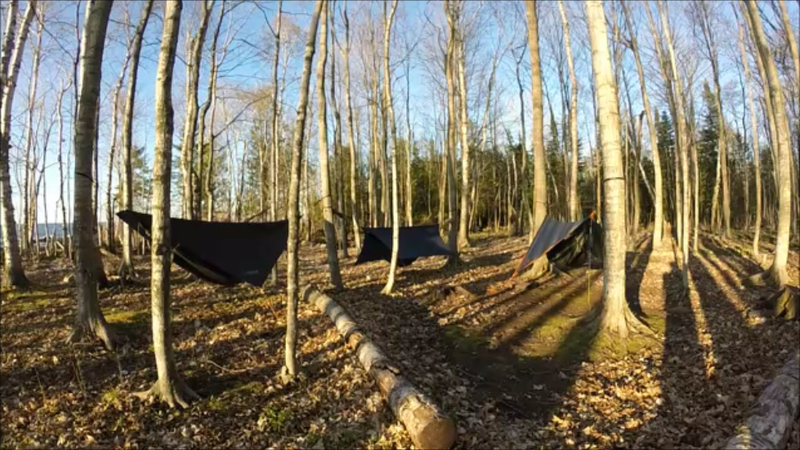 ​Wiser from our previous hammock hanging experience we selected adequately large, well-spaced trees for all three hammocks. John and I again shared one tree but it was more than solid so I don’t think our movements in our hammocks disturbed each other. Our setups looked quite respectable this time, somewhat surrounding a central area close enough to not feel alone but far enough that we didn’t disturb each other. It really was a beautiful spot. ​For dinner tonight we had PackIt Gourmet’s Tortilla Soup. We were still pretty hungry so John also fixed a Mountain House Chicken and Fried Rice with Vegetables package. I had a chocolate pudding but we were all kind of full and tired so finished off with hot chocolate instead. John got water this time and we filled all our water bottles with water so we would be ready to go in the morning. 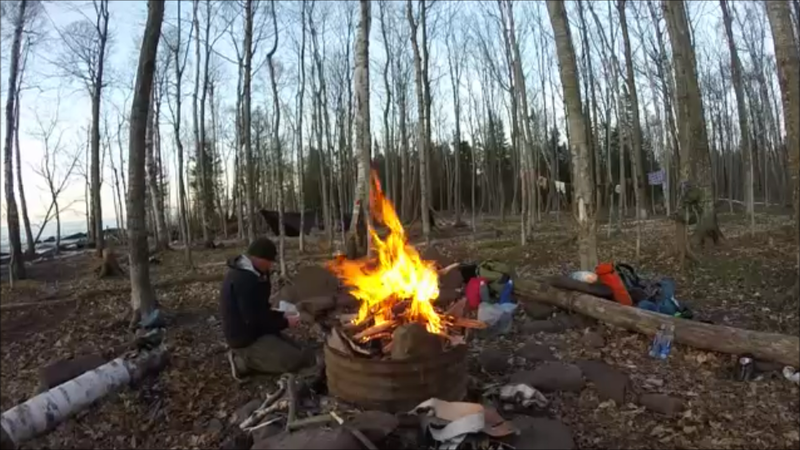 ​I also built a raging fire, using birch bark as the starter. That has to be the world’s best fire starter. I would almost go so far as to say their primary role in creation is to provide fire starters. And at that site large logs and small branches of birch was lying all around as well as many large pieces of bark already separated. I wanted to bring a big bunch of it home with me! Firewood itself was a little less easy to get but we manages and enjoyed a large fire for quite a while. Back at the cabin I also found birch bark but firewood was plentiful in the form of drift wood on the lake shore which I learned burns very well. ​We hiked 7 miles today, averaging 2.3 mph. Our highest altitude was only 736 feet and the lowest 554 feet. Statistically it was an easy day. ​Sometime between 9:00 and 10:00 we climbed into our hammocks and fell asleep quickly. I have to get up multiple times each night to water the trees and the second time I did that, probably around 1:00am or so I was just finishing when I heard a helicopter and saw its searchlight sweeping the trees nearby. My first thought was that it must be illegal to water trees at night in the woods! Then I wondered whether something had happened back home and they were trying to find us to get us home quickly. But sleep took over and returned to dreamland. 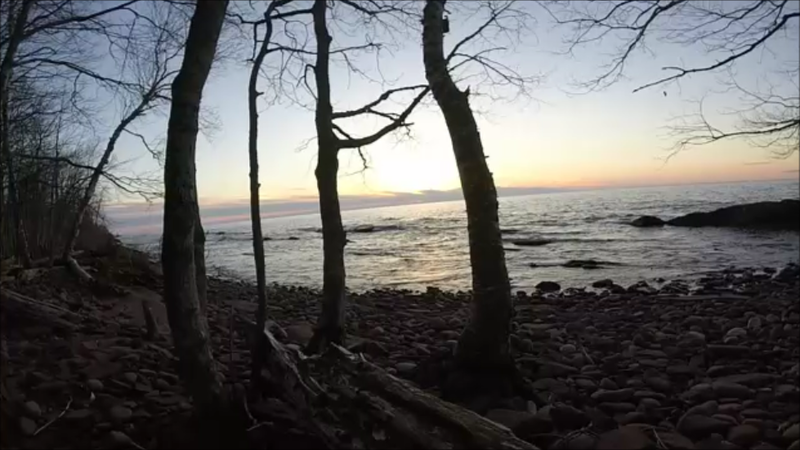 The sunset over Lake Superior was another beautiful one. he imagined a shipwreck and soon a rescued sailor would be washed ashore and John would have to give him his nice warm sleeping bag and stand there shivering without! I thought there surely must be a bad storm approaching and they are trying to get all the hikers out in time. When I stuck my arm out and felt the outside of my sleeping bag I was shocked. It felt like ice! And I could see flecks of ice on my tarp. Thankfully inside my bag it was toasty warm so we all just hunkered down and let happen what might happen.